Tybalt challenges Romeo to a duel for showing up to the Capulet's Party. "Thou, wretched boy, that didst consort him here, shall with him hence," 'This shall determine that," (p.1048 135-140). 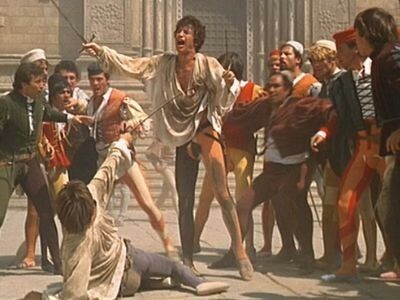 Romeo is speaking to Tybalt, they fight and Tybalt falls to his death. 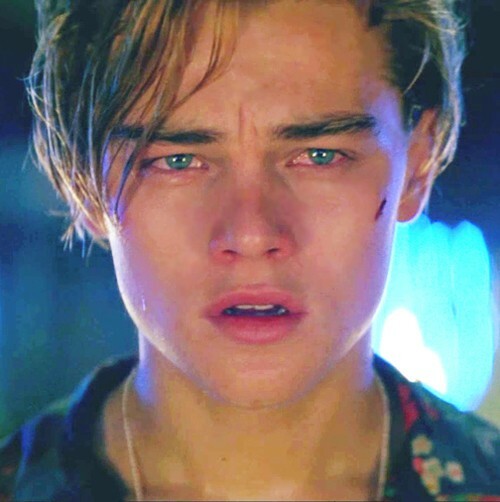 Since Romeo is a Montague, he can not be with Juliet, who is a Capulet. Therefore, Tybalt, Juliet's cousin, is going to try to kill Romeo for crashing the Capulet's Party and having interactions with Juliet. Tybalt gets killed by Romeo, and all the Capulets' agreed to banish Romeo from Verona and go to Mantua to never be seen again. Friar Laurence announces to Romeo that he has been banished from Verona and has to go to Mantua. "A gentler judgment vanished from his lips---- Not body's death, but body's banishment," ' But purgatory, torture, hell itself. Hence banished is banisht from the world's exile is death," (p.1056 10-20). Romeo is speaking to Friar Laurence, who just told Romeo he is banished due to the death of Tybalt and Romeo is upset. Romeo and Juliet can not be together, because Romeo is banished from Verona since he killed Tybalt and now Romeo is not going to able to see Juliet anymore. Romeo and Juliet spend the night together once last time before Romeo leaves for Mantua. "I must be gone and live, or stay and die," 'Therefore stay yet; thou needst not to be gone," 'Let me be ta'en, let me be put to death," (p.1062 10-15). Romeo is speaking to Juliet, because now he has to leave for Mantua but Juliet wants him to stay. Since Romeo and Juliet can not be together, she now has to wed Paris. Juliet does not want to marry Paris because she is already married to Romeo and she loves him. Romeo and Juliet meet at the Capulet's Party and instantly fall in love with each other until they both find out something that is going to make the situation harder than they expected. "Tis but thy name that is my enemy. Thou art thyself, though not a Montague," 'Call me but love, and I'll be new baptized; Henceforth I never will be Romeo," (p.1024 40-50). Romeo and Juliet have fallen in love but Juliet finds out that Romeo is a Montague which is suppose to be her enemy. Juliet's parents or any of the Capulets' will never let them be together let alone get married.